New Health Services Centre Opens! 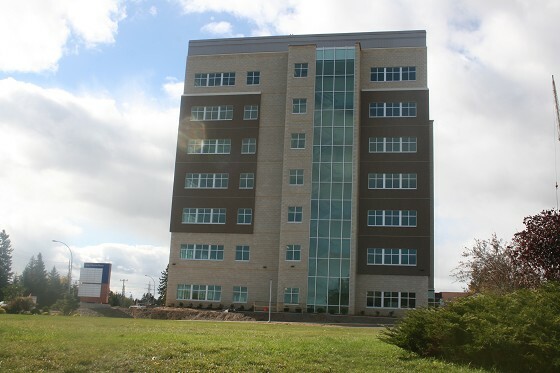 The skyline of Thunder Bay has changed noticeably in the Oliver Road\ area with the recent opening of the Health Services Centre - 1040 Oliver. The structure is about 110,000 square feet in size with about 102,000 square feet rentable. It is 7 floors plus a basement. The building is tall but the foot print is small.The building is very visible from many locations like the Expressway. “ There are some components of the building design which are a premium. The curtain wall or glass is a premium and can be less energy efficient than typical wall with insulation. The most glass is in the public areas and stairwells where there are people moving but not spending great time there. By putting glass on the stair walls it is encouraging staff and visitors to use the stairs in terms of health.” said Michelle Gibson, Partner at Form Architecture Engineering which has three divisions, Architecture, Structures and Interiors and 27 people on staff. The Health Services Centre at 1040 Oliver Road construction was started in late 2012 so getting it open for use in under 2 years is > excellent. The base building is largely complete and as the tenants come along more work goes on for example with the cyclotron installation. Jennifer Foulds is an Associate with Form Architecture Engineering. Jennifer has been involved in interior design colour choices and interior layouts of the new building. The Health Services Centre at 1040 Oliver Road will house the new cyclotron. The cyclotron is technically the most complex component of the building. Form Architecture Engineering were involved in the TBRHSC building here. 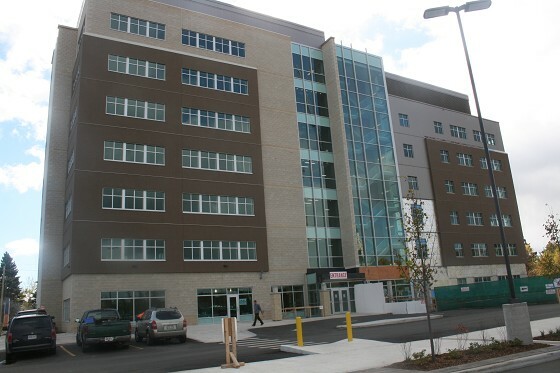 Typically hospitals are the most complicated buildings to work on so it was good experience for this new building. “ As the coordinating force the role of the architect is to bring all the pieces together. We can look back and feel good about what we created as a team. It is a good example of working together in a design build approach. In this integrated form of project the construction started before you are even finished the design which can compress the timeframe. Life labs is in there operating and the building is still under construction. You have to have special access to exists and stair wells.” said John Stephenson. The engineering team includes mechanical by KGS and and electrical done by AG Engineering as well as the MMM Group. “ We had to wait and see if the cyclotron would be in the basement, whether there would be a 7th floor and then there was the bedrock challenge. We had to blast the bedrock which was weaker to fracture but good to build on.” said Michelle Gibson. The cyclotron foundation is being poured now and is the bunker but the remaining floor space is radio pharmacy and cyclotron.